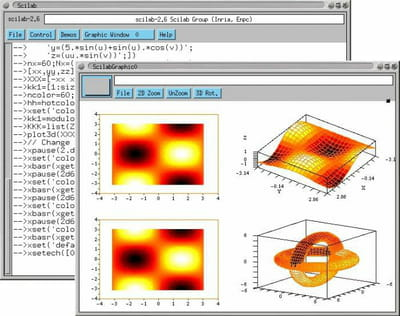 Scilab is a calculation software that proposes several mathematical functions which can be used in the educational as well as professional field. Detailed below are some of its many features. Mathematical application: The software is integrated with various mathematical functions ranging from basic functions to rational through linear algebra. This fact implies that it is then possible to solve complex problem. Statistic: Scilab also offers the user various tools to choose from in order to create and view statistics. There are also graphs that he can create in 2D or 3D according to his preferences. Customization: The interface of the software is fully customizable and some other functionality can be added to it. It is for example possible to add other mathematical formula and dynamic links to the interface thanks to C++ or Java languages. Signal: Scilab has tools to view, analyze and filter signals in the frequency and time domains. There are tools for generating signal, windowing data, estimating spectral power density or transforming signals like FFTW. The download of Scilab is completely free of charge. It is not really difficult to use. The software is in French. Latest update on August 6, 2015 at 09:48 AM.